I’ve attached a suggested emergency preparedness script developed by our Office of Emergency Management. This is a useful resource for you in the classroom and I strongly recommend you share this information with students in your current classes, as well as at the beginning of classes in the future. I recognize that issues of safety are top of mind for all at this time and am hopeful that this resource will help you feel as prepared as possible for any unexpected emergency. Our office of emergency management is a valuable resource for all and available to answer any questions you may have by calling 336.256.8632 or visiting http://emg.uncg.edu/. Attached is an update to UNCG’s Faculty Credentialing and Verification Policy. The policy has been revised to include a definition of the term, “Instructor of Record” (lOR). You will also note in the “Process” section of this revised policy an explanation of the lOR’s responsibilities when working with support staff and teaching assistants in classrooms, labs, and recitation sections. Please distribute this policy to all faculty and monitor compliance with it, effective immediately. For questions about this policy, please contact Dr. Jodi Pettazzoni, Associate Vice Provost and Director of the Office of Assessment, Accreditation, and Academic Program Planning at jepettaz@uncg .edu. Please also remember that when a faculty member teaches a course with content they have never taught before, they must be credentialed anew for that course, even if the course is within the same department or program where they normally teach. For questions about faculty credentialing, please contact Ms. Andrea Whitley at arwhitle@uncg.edu or Ms. Suzanne Angel at shangel@uncg.edu in Faculty Personnel Services. Deloitte elected to profile UNC Greensboro as a case study. The information that follows is from that report. As part of a broader effort to document transformational approaches to student success, Deloitte had the opportunity to study the University of North Carolina Greensboro’s (UNC Greensboro) powerful results in closing the attainment gap for African-American and Hispanic students. UNC Greensboro was founded as a women’s college in 1891. In 1960, it became one of the first universities in the region to graduate African-American students; in 1964, the first men enrolled. Over the same period, UNC Greensboro transitioned from a commuter school to a residential campus. Arriving in 2015, Chancellor Franklin D. Gilliam Jr. extended UNC Greensboro’s long-standing commitment to student success when he challenged the institution to take “giant steps” to further its vision and improve student outcomes. The data shows the results. Overall completion rates have gradually increased with the largest gains among black and Hispanic students. 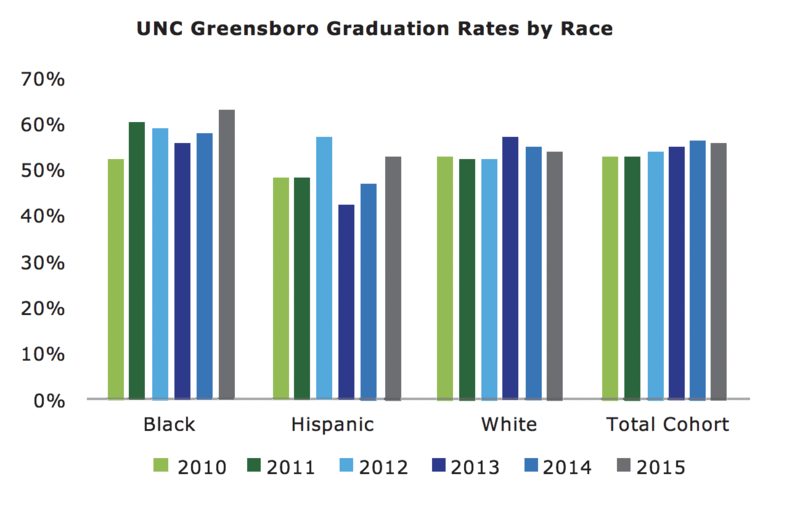 Over six years (2010–2015) the graduation rate for black students increased from 52 percent to 63 percent; for Hispanic students, it went from 48 percent to 53 percent (see figure 1). 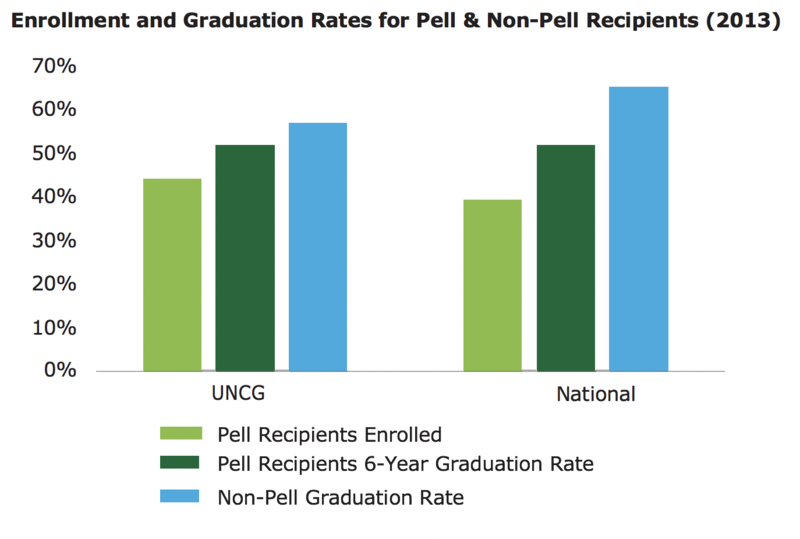 Additionally, UNC Greensboro has closed the gap between Pell and non-Pell graduation rates to 5 percent, compared to a gap nationally of 14 percent (see figure 2). What is the key to UNC Greensboro’s results? spanning faculty, staff, and administrators has created a “culture of care” infused into the institution’s daily work. UNC Greensboro continually innovates through an iterative process to identify not only which resources impactfully support students, but how to deliver them as efficiently as possible. As an extension of this innovation mindset, UNC Greensboro values community partnership and actively participates in a network of peer institutions that share a commitment to student success and continuous learning. Provost and Executive Vice Chancellor Dr. Dana Dunn explains, “Here it is more about culture…there has been a paradigm shift away from institutions aspiring to become more prestigious and elite through greater selectivity in terms of the students that they take, to an understanding that we are here to serve students and make them successful upon graduation—it is incumbent upon us to embrace that and do that well.” Though it may seem like a simple idea, holding and acting on this commitment is just as key to an institution’s student success as the specific interventions it pursues. UNC Greensboro’s progress has come under the watch of numerous institutional leaders, each building on the work of its predecessor. One broad example of its “students first” commitment can be seen through the “culture of care” initiative. Sustaining a culture of care across campus has become institutionalized through a training designed by Student Affairs that prepares faculty, staff, and administrators to learn how to effectively identify students in need and refer them to the appropriate resources. After completing a voluntary two-hour training course, attendees receive a “UNC Greensboro Cares” sticker to hang on their door as an invitation for any student to seek assistance, academic or otherwise. UNC Greensboro has considered how to innovate in support of student success at every stage of the student experience, especially for underrepresented minority, first-generation, and low-income students. Ahead of admissions, the University has implemented programs to better engage potential students and their families, intentionally using the word “family” to represent a broad group of supporters who could aid and influence applicants. First-year students have robust tools to adjust to UNC Greensboro’s culture and academic demands, and students identified as “at risk” receive additional support. As students arrive, Director of New Student Transitions & First Year Experience, Kim Sousa-Peoples shared the special attention given to orientation, “There are a lot of first student moments, and that is a big one. We knew that many of our students came here because it felt like home, or it offered diversity. Through how we staff orientation and present programs, we go over the top to showcase our culture of care and student services. We have a fun, informative, distinctive program—parents with multiple kids in college say our orientation is the best. To innovate its advising, UNC Greensboro created an Advisors Institute program for professional development and recognition, with “Blue” and “Gold” level designations (University colors) as advisors progress. Workshop topics include ethical dilemmas, building relationships with advisees, defining advising relationships through referrals, and technology. UNC Greensboro realized that to achieve its goals it needed to look beyond its four walls for ideas. It is an active member of the American Association of State Colleges and Universities (AASCU), an organization that represents universities and systems whose members share a learning and teaching-centered culture, a historic commitment to underserved student populations, and a dedication to research and creativity. UNC Greensboro is also a member of the Frontier Set, a select group of higher education institutions committed to significantly increasing student access and success, and eliminating racial/ethnic and socioeconomic disparities in college attainment, that is supported by the Bill and Melinda Gates Foundation. In addition to the Frontier Set, UNC Greensboro has been invited to participate in the Association of Public and Land-grant Universities’ new Transformational Student Success Cluster initiative, a five-year collaborative focused on student success best practices. Institutions will be clustered based on geographic location. UNC Greensboro will be a member of a cluster of southern universities with a commitment to student degree completion, eliminating the equity gap, and expanding access to higher education. Within North Carolina, UNC Greensboro has signed agreements with six local community colleges to co-admit students who then complete their first two years at community colleges and transfer to UNC Greensboro, significantly reducing the total cost of a bachelor’s degree. As a community partner, UNC Greensboro works with local and state entities to expand its impact. For example, in 2016, its new Union Square Campus opened as a home to nursing and health care education programs for UNC Greensboro, NC A&T State University, Guilford Technical Community College, and Cone Health. 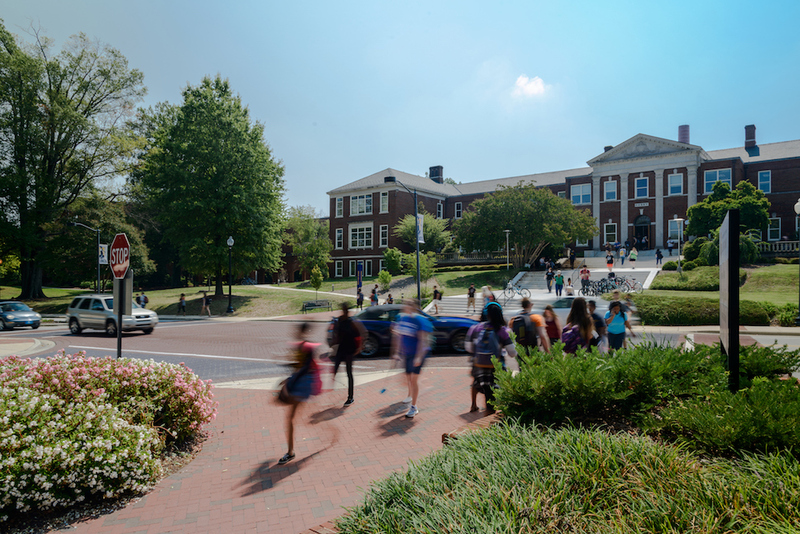 UNC Greensboro constantly evaluates how best to build upon its success and aims to scale its initiatives and maximize efficiency, such as with its successful UNCG Guarantee scholarship program. This program provides scholarships and numerous support services to reach 35–50 low-income students annually. In an attempt to scale the support services offered to Guarantee scholars, a new student success coaching initiative has recently been funded through a generous grant from the Edward M. Armfield, Sr. Foundation, Inc. Targeting first-year students who have been identified as likely to benefit from additional support and resources, this program will utilize graduate students as “coaches” to act as case managers and address academic skill development, perseverance, resilience, and motivation, while also connecting students to other University supports and services necessary for success. This program will teach students how to recognize challenges and resolve them independently. The UNC Greensboro team continues to explore how to scale the program benefits in a cost-effective way to reach more students. Launching the Spartan StartUp summer bridge program for the incoming class of 2018, the institution aims to further increase retention of historically disadvantaged students through early exposure to college courses and academic supports, a first-year experience course, peer mentors, and supportive faculty-student relationships. Programming starts in the summer and continues through the academic year. With so much momentum, the institution is also mindful to track initiative fatigue to understand where faculty, staff, and administrators themselves may need support. UNC Greensboro’s success proves that innovation and equity can go hand-in-hand. With a history of leadership that places students in the center and practical innovations to drive a culture of care, UNC Greensboro shows what is possible when an entire campus commits to student success and serves as a beacon for other institutions that wish to do the same. I am writing on behalf of the O. Max Gardner Award committee to ask that you assist us with the nomination process for the 2019 award. The Gardner Award is awarded by the UNC Board of Governors and has been given annually since 1949. The award was established to recognize faculty who have “made the greatest contributions to the welfare of the human race.” The Board of Governors solicits nominations from UNC campuses in the fall semester each year, and a BOG committee decides on the system-wide winner during the spring semester. The winner receives a cash prize and recognition at the May BOG meeting. Those chosen in the past have been persons who have made notable contributions of national or international scale. See information regarding last year’s winner here 2018 O. Max Gardner Award Winner. The role of our UNCG Faculty Senate-based committee is to solicit nominations, recommend the campus nominee to the Provost and Chancellor, and assist with preparation of the nomination materials that are put forward to the Board of Governors. To better honor our campus nominees, I have allocated a $1000 award for our campus nominee. One thing to note about the award criteria: the award is based on the significance of accomplishments made during the past year. Of course, big accomplishments almost always arise after an extensive history of work. So, don’t discount putting forth a nominee whose long-standing work has culminated in an interesting way over the past 12 months (we can put forth nominees multiple times). For more information on our past nominees, our committee, and the nomination process, please visit the Provost’s O. Max Gardner Award information page. The deadline to submit nominations is Friday, October 26, 2018. Feel free to forward this to others; nominations are encouraged from all on campus. If you have any questions, committee members contact information may be found here. The Nomination Deadline for the Alumni Teaching Excellence and Board of Governors Awards is Wednesday, August 29! Happy first day of classes! We’ve got a longer than usual newsletter to get things started, but if you power through the updates with us then you’ll find a link for a book raffle. Communicating the value of your course. Imagine a student can choose between your course and another course to fulfill a requirement. Using only a discussion about the value of the course, convince this student to take your class. Try writing down your argument. Think about how course content connects to student interests, the skills students will learn, the habits of mind they will develop. Then, build this imagined discussion of value into this first week of class. Communicate value day one and beyond.Don’t let the benefits of this reflective exercise end with the first week of class. You may start communicating that value on day one through your syllabus, but also find ways to return to it throughout the semester. You may see your students’ motivation increase as they make clear connections in their learning. For more, you might look at this guide from Carnegie Mellon to help you with some key strategies for approaching student motivation and engagement. You can find a downloadable copy of our 2018-19 event calendar on our website. If you have taught online before you are ready to explore new approaches and strategies, Level Two is the Online Learning course for you. Participants review the latest research about what works in online environments, learn new ways for students to collaborate online, create new resources with media tools, explore new ways to facilitate and create assessments and experience a variety of communication tools from the viewpoint of a student. Current participants emphasize that the course is an important source of accountability as they work on an upcoming course. Click on the link below to sign up for the Fall Session! Join ITS Learning Technology in Bryan 209 from 1-2pm this Thursday and Friday (8/16 & 8/17) for an overview of the UNCG teaching station with practical support to get your semester started smoothly! The Teaching Innovations Office, in collaboration with the Title III Intentional Futures Grant, is excited to welcome to campus Sarah Rose Cavanagh, author of The Spark of Learning: Energizing the College Classroom with the Science of Emotion, on the morning of Monday for a visiting lecture and workshop. In the meantime, you can find out more about her book here! Join us for dialogue about UNCG student experiences in the classroom and beyond. In collaboration with the Office of Intercultural Engagement, VOISES panels provide a venue for faculty to hear the perspective of students from marginalized identity groups on campus. Our first panel is Wednesday, August 29th from 1-2:15pm in the Faculty Center and the focus will be on LGBTQA experiences at UNCG. Click here to sign up for this and other VOISES panels. Literary Circles unite faculty around a reading related to the scholarship of teaching and learning. We provide the books, and you provide the thoughtful conversation! There will be four literary circles for Fall 2018, starting September 4th. Check out the options below and then sign up here. Once groups start in September, they will set their own schedules for the semester. On Course by James M. Lang – A week-by-week guide to your first semester of college teaching. On August 28th, the UTLC will release its new Teaching Tips Podcast, hosted by Ben Peterson in the Teaching Innovations Office. The podcast brings guests from across the UNCG community to talk about key topics related to learning and student success on our campus. Email teachingtipsguy@uncg.edu if you have ideas for a topic or someone you’d like to hear as a guest! The end of the month also brings our new video series, “___ On College,” in which we steal some moments to talk teaching and learning on College Ave with great teachers. Come see what new things you’ll learn from Spartans who think deeply about pedagogy and student learning as we talk with someone new On College each month! This year, the UTLC is changing up our existing weekly Coffeehouses in order to reach a broader set of tastes and schedules! Coffeehouses will continue to happen as usual on the first Wednesday of every month, but every other week will have a new theme with new options to enjoy with your colleagues in the Faculty Center! Biergarten: On the third Wednesday of every month, join us from 4-5 for our new Biergarten! The Biergarten is a nice way to shift gears at the end of the day and catch up with friends in the center of campus. Our first Biergarten is next week, so we’ll see you on August 22nd! New Faculty Brown Bag: On the second Thursday of every month, the UTLC invites faculty new and seasoned to bring their lunch to the Faculty Center from noon-1pm and chat about the challenges that new faculty confront in their careers. Soda Shop: On the fourth Thursday of every month, the Faculty Center goes back to its roots as the campus Soda Shop, but this time it is the faculty who will be the focus of some classic ice cream and soda. Join the UTLC from 2-3pm for an afternoon pick-me-up with a nostalgic touch! If you’ve made it this far in our extended start-of-the-semester newsletter, then click here to enter into a raffle for one of five books on the science of learning! This week, Elon University welcomes area university and college educators to the 15th Annual Teaching and Learning Conference on Thursday, August 16, 2018. The conference is jointly sponsored by Elon’s Center for the Advancement of Teaching and Learning (CATL) and Teaching and Learning Technologies (TLT), and attendance costs are covered by these sponsors, so all you have to do is sign up and show up! This year’s conference theme is Busting the Myths of Teaching and Learning. In interactive sessions and pedagogy presentations – including several from folks at UNCG – attendees will challenge myths, misconceptions, and hidden assumptions related to teaching and learning, and explore the evidence-based research that debunks them. Attendees will also reflect on how these ideas have influenced both our practice, our discipline, and our students. You are invited to participate in the “Applying the Quality Matters Rubric” face-to-face, 1-day workshop at UNCG, which will be taught by certified Quality Matters instructor Dr. Racheal Brooks of NCCU. UNCG Online has organized this workshop for faculty and staff. Materials and lunch will be provided, so there is no cost to you! For instructions on how to register for this opportunity, click here. 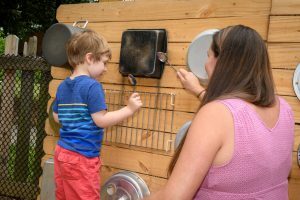 Master’s student and preschool teacher Kathy Spivey plays with a child at the mud kitchen, part of the new sensory garden at UNC Greensboro’s Child Care Education Program. 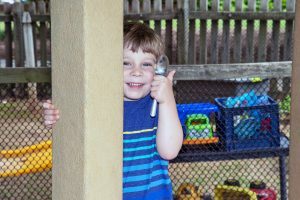 UNC Greensboro researchers and child care professionals know that inclusive opportunity for intellectual stimulation begins long before elementary school, and that the best opportunities occur through a multiplicity of sensory experiences that encourage make-believe. This knowledge is the source of a project recently completed by Kathy Spivey, a teacher at UNCG’s Child Care Education Program and a master’s student in UNCG’s Birth through Kindergarten Interdisciplinary Studies in Education and Development Program, offered jointly through the Department of Specialized Education Services in the School of Education and the Department of Human Development and Family Studies in the School of Health and Human Sciences. 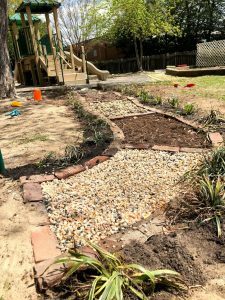 With the understanding that outdoor play reduces stress and increases confidence in young children, Spivey developed a plan to enhance the outdoor area at UNCG’s child care center by building a sensory garden that would give children more opportunities to create and lead their own play. “Sensory gardens are known to help children with and without disabilities with tactile stimulation, improving sensory integration and processing skills,” Spivey observed in her proposal. She intended for the garden to be accessible to children with differing abilities, and it would be her capstone project for her internship in inclusive early education, which was to reflect leadership and contribution to community. In planning and constructing the sensory garden, Spivey not only worked with her advisor Dr. Linda Hestenes and her internship professor, Dr. Susan Kingsley, but also Dr. Judy Kinney in the Department of Community and Therapeutic Recreation, director of UNCG’s Child Care Education Program Dr. Sharon Mims, the grounds crew from UNCG Facilities, cross-campus partners Beyond Academics and the very families whose children would eventually play in the garden, and, perhaps most importantly, the children themselves. Spivey issued surveys to the families about their children’s outdoor play and what they would like to see on a playground. 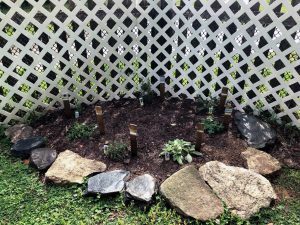 Spivey also planned work days during which families and children participated, as well as volunteers from Beyond Academics, and undergraduate therapeutic recreation student Norma Rodriguez, who focused her senior honors project on her work on the sensory garden. Spivey also created an evaluation tool – a quantitative playground assessment using the Best Practice Indicators and the Preschool Outdoor Environment Measurement Scale. 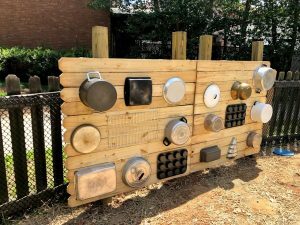 With her team of volunteers, Spivey constructed three sensory pathways, sun catchers, a mud kitchen and a unique music wall made of donated pots and pans. 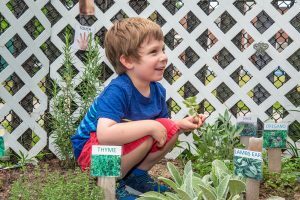 Children were invited to select the plants that would grow alongside safe herbs – labeled with pictures to help them more easily begin to identify them. “Including children in the decisions motivates them to take pride in the space,” explained Spivey. When the children used their new outdoor play-space, multiple teachers noticed that they were more engaged in the play spaces ‒ using their senses to explore, describing their learning in expressive language and requiring less redirection. The enhancements also revitalized the children’s interest in pre-existing structures, such as the stage near the music wall. Spivey also noticed that children who didn’t typically play together were doing so, with new camaraderie through their enjoyment of the space. “They’re excited to walk along the pathways, and to feel and smell the herbs. Some are interested in collecting rocks to add to the pathways. Many love to “cook” in the mud kitchen and play music with their friends at the music wall,” said Spivey.